Ubuntu 14.10 ‘Utopic Unicorn’ will be released on October 16, 2014. This is current release plan and will may change during the development cycle due to the blocker bugs. The release dates are given in Ubuntu Wiki . The Current stable Ubuntu is Ubuntu 14.04 LTS and it will be supported for next 5 years. Ubuntu 14.10 has Alpha1, Alpha2, Beta 1, Final Beta and a Release Candidate on its release cycle. Other Ubuntus includes Xubuntu, Lubuntu, Kubuntu and Ubuntu GNOME are also available for testing after the alpha. The total release cycle for all the other ubuntus will also include two alpha and a pair of beta milestones. These are planned by the respective development teams so there may be slight changes in all these. 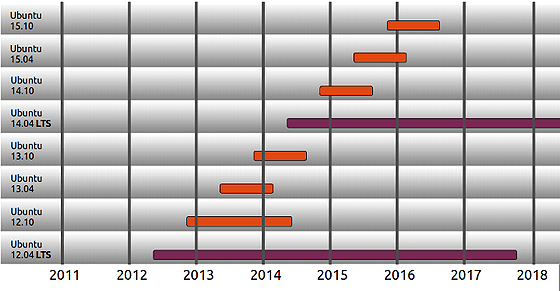 The Ubuntu 14.10 release cycle given below.